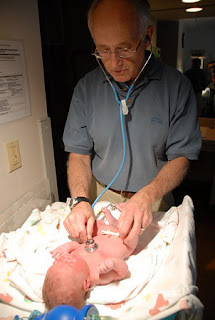 Here's our pediatrician, Dr. John Clapper, giving Abby her first check-up at the hospital. We had our first appointment with him today. She has gained weight well and is above her birth weight at 7 lbs. 10 ozs. She is measuring 21 inches. That puts her at 25% for weight, 75% for height and 50% for head circumference. So far, she's got her dad's tall, lean body. Everything looks healthy with this girl. Praise the Lord!